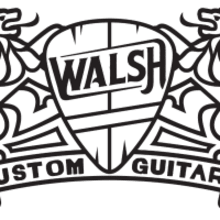 Walsh Guitars is committed to you and your artistic vision, and we will use all our resources to see it to completion. One of the great parts of being such a small operation is the level of involvement in each step of the process I get to take and the assurance that each step will be done with excellence. As an artist of sorts, I feel like I will never truly arrive as there are always ways to improve my craft and up the ante of what this gear community currently offers. Its an endless chase, and I love it. The other great part of the intimacy of Walsh Guitars is the time I am able to put into building customer relationships. Guitars are great but people are even more important, and this is where my focus begins and ends. Each person has unique desires and an exciting vision for their project; to be able to come alongside and make that a reality is incredibly rewarding. Walsh Guitars is committed to choosing the very best wood, parts, and electronics all while ensuring they expertly come together in a happy and toneful medley. As the saying goes, “the devil is in the details.” It is exactly my job to make sure those details are seen to, improved upon, and studied to the millionth degree. And even as the project evolves and details change, great attention will be given so that the very best quality is maintained. I will choose the wood by hand, the parts by experience and functionality, and the electronics by ear of what works best. Everything will be kept under tight tolerances for a predictably great sounding and feeling instrument. Walsh Guitars is committed to not only great looking instruments but also great sounding and inspiring works of art. The best audio techs are those who are musicians as they know what instruments should properly sound like in a live or studio environment. In the same way, the best luthiers are those who passionately play guitar and know how it should sound AND feel. As a frequent player of all styles of music, it is my hope that every instrument I create can effectively communicate with authority every genre thrown its way. From houses of worship to singer/songwriter settings to arenas, Walsh Guitars will deliver an instrument to rule them all and inspire you in the process.